It's easy to find a place to stay, but we sort through all of the options to find you the best home. We won't be satisfied until all of your requests have been met while staying within your budget. 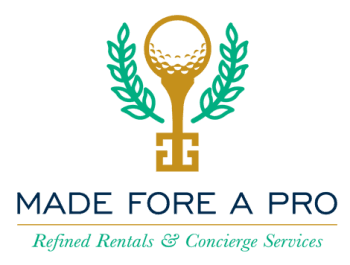 Made Fore A Pro is Augusta’s only boutique rental company specializing in accommodations within three miles of the Augusta National, offering homes for professionals both on the golf course and in the boardroom. Our mission is to provide a superior Southern golf experience, truly unlike any other. Situated on over 3 acres in Forrest Hills, this nearly 80 year old home features plenty of room to entertain both inside and out. The newly remodeled kitchen features a large gas range with double oven, ice maker, 2 sinks, and ample counter space. The dining room will have a table to seat 12-14 but there is ample room for additional tables. The den will have a wet bar with fridge, pool table, and comfortable seating. Outside the large porch overlooks the beautiful backyard. There is also a side patio with seating. All bedrooms are located upstairs. Renters could expect cosmetic updates to the large master bath. This fantastic home is right next to Augusta Country Club. It is within 3 miles to the Augusta National. It has 6,800 sq ft with 6 bedrooms/4.5 baths. It has a bonus room which could serve as the 7th bedroom. This home has great entertaining areas and would make a wonderful host home. The kitchen has been updated with a large island in the center and has a nice breakfast nook. The laundry room has an extra refrigerator. The homeowners are updating the back yard with a new landscape plan and adding a outdoor kitchen. I have been coming to the Masters for the past 16 years but it was not until four years ago that I started to enjoy the true essence of Masters Week and the transformation that takes place in Augusta. Made Fore a Pro has introduced us to the southern spirit and charm of the week, simply by treating our group as family. The best homes in the best locations with the best service. We used to rent houses, and we were lucky to have a hand scribbled note of welcome thrown on the kitchen table. Now we are greeted with everything we need to make the most of our time; and we always know that help is one phone call to Gabby or Maureen away. If you have ever been a customer of Nordstrom, you know everything you need to know about the team at MFAP. Thank you, Made Fore A Pro! 3 times a charm! Returning as homeowners for the third year working with your company has proved to consistently be a great experience. The caliber of your rental clientele is exceptional and our renters treated our home as if they truly were guests! We found our house in better condition upon our return than when we left! The process for homeowners was extremely efficient and we are hoping to secure our 4th consecutive contract for Masters 2016! Thanks, Gabby and Maureen! Well done! Made Fore A Pro has been enthusiastic about serving the needs of the homeowner, always responsive and cheerful in dealing with any and all transactions, questions, et cetera. The relationship has been so successful that we have acquired repeat patrons for our house with no hassle, something that I greatly appreciate, especially as an out-of-towner myself.